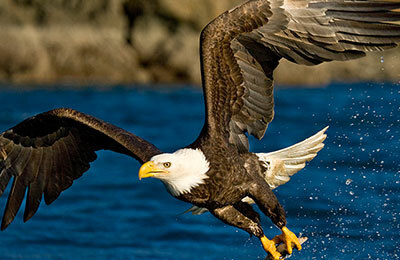 Bald Eagles are one of the most recognizable birds in the United States. If you don’t remember what a Bald Eagles looks like, simply pull out a quarter or a dollar. An eagle is shown on the back of the quarter and holding an olive branch and arrows on the one dollar bill. Bald Eagles are large, predatory raptors. They are dark brown on the body and wings. The head and tail are bright white. The feet and bill of Bald Eagles are yellow. The bill is large and hooked at the tip. Size: Bald Eagles grow to about 2½-3 feet in height. They have a wingspan of about 6½ feet. Female Bald Eagles are larger than the males. Diet: Bald Eagles love fish! When fish are not available, Bald Eagles will eat whatever they can catch including small birds, rodents, and dead meat. Bald Eagles have no problem stealing food from other birds! Typical Lifespan: Bald Eagles can live to about 20-30 years of age in the wild. They live even longer in captivity. Bald Eagles in the wild face a lot of threats that reduce their lifespan, including chemical pollutants, such as mercury, persistent organic chemicals, heavy metals and DDT.